This is the ultimate tour package for a visit to three of our favorite attractions to explore the Bay Area's wildlife! 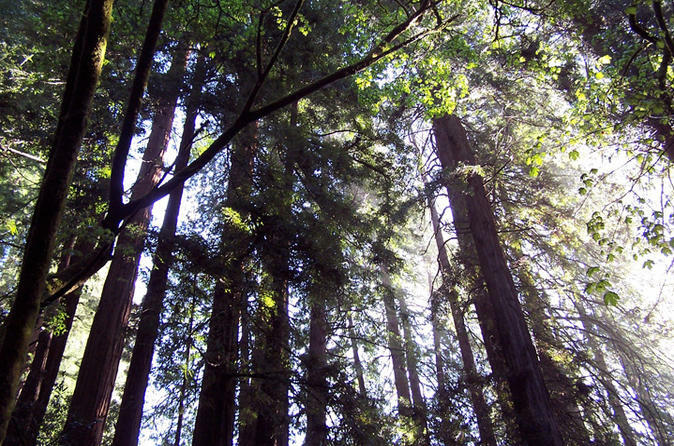 Enjoy a bus tour over Muir Woods National Monument to experience California's coastal redwood trees. Then at your own pace, head over to Aquarium of the Bay at Pier 39, and the world-famous San Francisco Zoo - the largest in Northern California! Great for families, and visitors of all ages, this tour package allows everyone to enjoy some of San Francisco's most beloved attractions all in one! The coach holds up to 40 people. Your experience starts with a guided bus tour to Muir Woods National Monument home to the world’s tallest 1000 year old coastal redwood trees. Experience the awe and wonder as you are driven through Northern California’s signature fog, while you wander in and out of the redwood's alleyways. Entrance fee into Muir Woods is included in the tour. Daily tour departures to Muir Woods at 9:00am, 11:00am, and 2:00pm. Complimentary hotel shuttle service provided from most San Francisco area hotels and SFO airport-area hotels with advance notice. Next, your package also includes entrance tickets into the Aquarium of the Bay at Pier 39 and the San Francisco Zoo, both to be enjoyed at your own leisure. The Aquarium of the Bay at Pier 39 focuses on restoring the local habitat of San Francisco. See schools of Anchovies, giant sea bass, and colorful starfish. The San Francisco Zoo is one of the largest in Northern California, and it's home to more than 2,000 exotic, endangered, and rescued animals, representing more than 250 species. Get out of the hustle and bustle of the city, and into three of San Francisco’s beloved attractions to explore the wild side of the city. Package to be completed in the same day of 9:00am Tour selected. Otherwise, this package must be completed at your leisure over 2 days. (Attraction admission are open tickets).